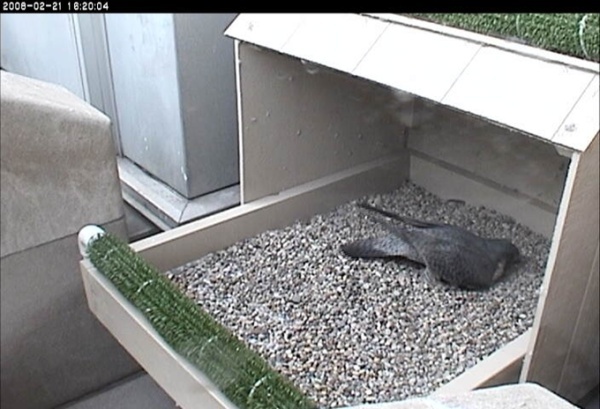 Peregrines require a high ledge with gravel or a similar substrate in which to sculpt a depression for their nest. The depression itself is the nest. It is only as big as the peregrine’s body. 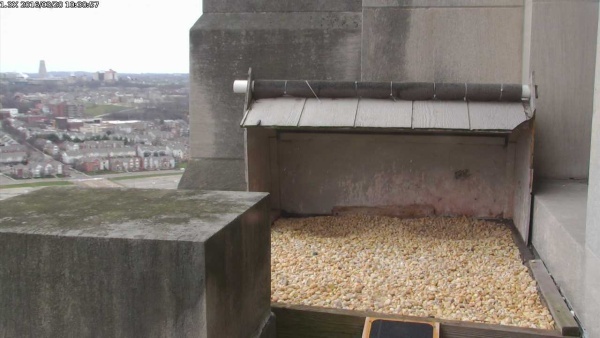 When peregrine falcons were quite rare in Pennsylvania, nest boxes were placed on two buildings in Pittsburgh after the birds had chosen those sites as their territories. Buildings do not have deep gravel on their ledges; the nest boxes provide suitable substrate. The nest boxes were custom made to fix the ledge locations where they were placed and are much larger than the peregrines require for the nest. 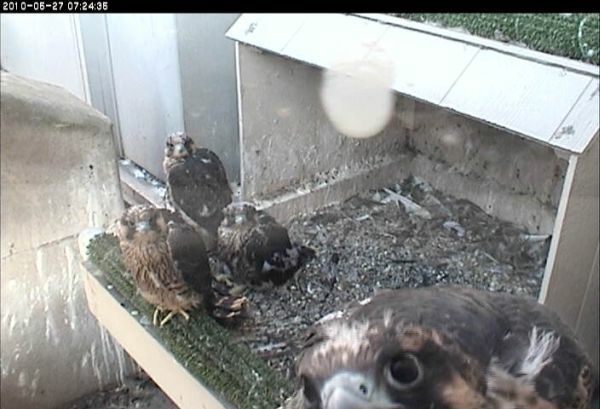 On the webcams you can see that the peregrines walk around on the large gravel surface. At the Gulf Tower, shown above, the ledge is longer than it is wide. The custom-made nest box is constructed of red cedar where wood is in contact with the birds, and of weather-resistant treated lumber elsewhere. The dimensions are: 57″ long by 42.5″ wide and 6″ deep. A three-sided shelter (18″ deep by 12″ high) with a roof is located at one end. The bottom of the box is filled with approximately 500 lbs. of “shot” size river (round) gravel upon which the eggs are laid. The peregrines dug two depressions at this site, visible under the roof of the box. At the University of Pittsburgh’s Cathedral of Learning the ledge is almost square. The custom-made nest box was constructed by the PA Game Commission to fix the ledge using these dimensions: 37″ long by 30″ wide and 5 3/4″ deep. A three-sided shelter (16″ deep by 16″ high) with roof is located at one end. The bottom of the box is filled with approximately 300 lbs. of “shot” size round gravel.